Pfast Holes and Fasteners - Pfast draws ANSI and Metric drilled holes, clearance holes, countersunk holes, counterbored holes, threaded (tapped) holes, pipe threads and fasteners. Each hole and fastener is a parametrically defined block, making it easy to move, copy, rotate and otherwise manipulate the object while saving disk space. Fastener assemblies (fastener, nut and washers) are associated using groups, allowing the assemblies to be selected as a unit or individually. Pfast Holes and Fasteners retain description, size and thread information that can be listed with the PfastList command or for use in leaders with the the PfastLabel command. Layer, linetype, color and lineweight properties can be assigned by customizing the Pfast.ini file. Many of these properties can also be adjusted after insertion using the various Pfast Edit commands. 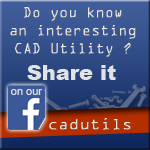 Pfast by CCAD inc. works with AutoCAD 2000 and later, but does not work with AutoCAD LT.
Drilled Hole - Creates a specified drilled hole. Clearance Hole - Creates a specified clearance hole. Countersunk - Creates a countersunk hole. Counterbore - Creates a counterbored hole. Threads - Creates a threaded hole. Pipe Threads - Creates internal or external pipe threads. Fasteners - Inserts standard screws, nuts and washers. Pfast Label - Place automatic note on fastener or hole. Pfast List - List or identify selected hole or fastener. Pfast Edit - Edit a hole or fastener using Refedit. Toggle Center Marks - Toggle marks on and off in holes and fasteners. Make Object Solid - Change linetype to continuous of object in hole or fastener block. Make Object Hidden - Change linetype to hidden of object in hole or fastener block. Change Object Ltscale - Change linetype scale of object in hole or fastener block. Toggle Group Selection - Turn group selection on and off.